The Onny Meadows includes an orienteering course which has been used for many events. The British Orienteering website contains an introduction to the sport and an events list. Geocaching is treasure hunting for the 21st century. With an easy-to-use, hand-held GPS (Global Positioning System) you navigate to different locations and when you get there you open the cache or find out the secret. We have one mini-trail and three that get you out into the countryside. Read on for details. This is an introduction that combines our Secret Stones Trail in the Onny Meadows – where you can discover some of the stories of Shropshire’s fantastic rocks – with the GPS system. Five big pieces of different Shropshire rocks have been placed out in the meadows. Find each piece, work out from the description which one it is and discover a fascinating fact. The trail goes through the meadows on grass paths so it may be muddy depending on the weather. Our newest Geocaching trail starts as soon as you step out of the building and pick up the satellite signal. 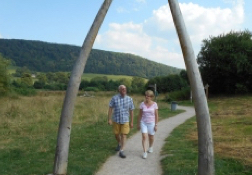 It then leads you on foot into the countryside around Craven Arms where you can walk along an ancient trackway, a Roman road, a medieval coach route and across Shropshire’s first runway! Find the numbers in certain caches to get the combination to open the Golden Cache and collect a treasure at the Discovery Centre. Shropshire is scattered with sites from the Second World War. On this trail your mission is to scour the Long Mynd, finding four sites with an interesting bit of history. Each cache tells the story of that particular place, which may well be something you’d never have guessed! Full instructions for the route to follow in your car are given. Then park and follow the GPS (and the clues given on the trail) into the countryside to locate the cache. For more information about the Long Mynd and Carding Mill Valley, follow the National Trust link on this page. 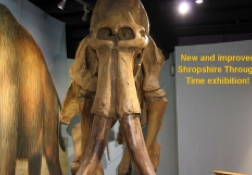 Would you like to discover some of the mysteries of Iron Age Shropshire? One of the places you’ll visit is a mammoth construction site – the location of a hill fort that took 400 years to build! Each cache tells the story of that particular place. Full instructions of the route to follow in your car are given. Then park and follow the GPS (and the clues given on the trail) into the countryside to locate the cache. Ring us to reserve a GPS for your group on the day you would like to visit. You don’t need to pay us until you come to collect your GPS unit and trail. 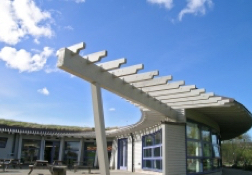 On arrival at the Shropshire Hills Discovery Centre go to the Front Desk to collect and pay for your unit. Please note we will need a refundable deposit of £50 or credit card details. Then head out into the countryside and start exploring! Geocaching – once you’ve got the bug – get involved yourself! Geocaching is an international sport – enthusiasts place caches not just all over the UK, but all over the world! Details of the caches are then posted on the Geocaching website, for other enthusiasts to go and find. 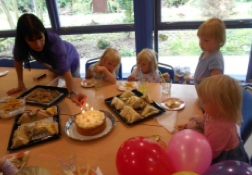 There are more than 40 caches within 10 miles of the Discovery Centre, only a few of which we created. The caches are filled with a log book to record your journey and items you can take, as long as you put something else back in the cache.